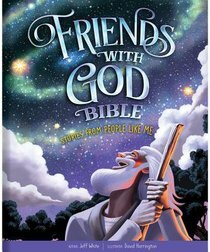 Containing 54 first-person accounts from familiar Bible characters, this storybook is sure to immerse readers in these faith-building stories. A free app available for download lets readers collect, share, and even create digital cards describing these Bible-time friends of God. Full color. About "Friends With God Bible: Stories From People Like Me"
White is creative director at Group Publishing, where he oversees Group's design, branding and identity. A graduate of Biola University, he has produced award-winning creative work for clients large and small. He lives in Colorado with his wife and two kids. David Harrington's love for art began at an early age when he drew on everything, which eventually led to a career in illustration. He graduated from the Art Center College of Design in Pasadena.